Wonderful morning at the JCC preschool! The targeted Social Thinking® concept for today was Sharing An Imagination. A shared imagination is the ability to imagine what another person is thinking, feeling, and/or pretending. Through Shared Collaborative Imaginative Play children learn an essential skill set to enable them to work and learn in groups, develop social relationships, and engage in socially-based critical thinking or social problem solving. When is a spatula not a spatula? When is a cardboard tube not a cardboard tube? 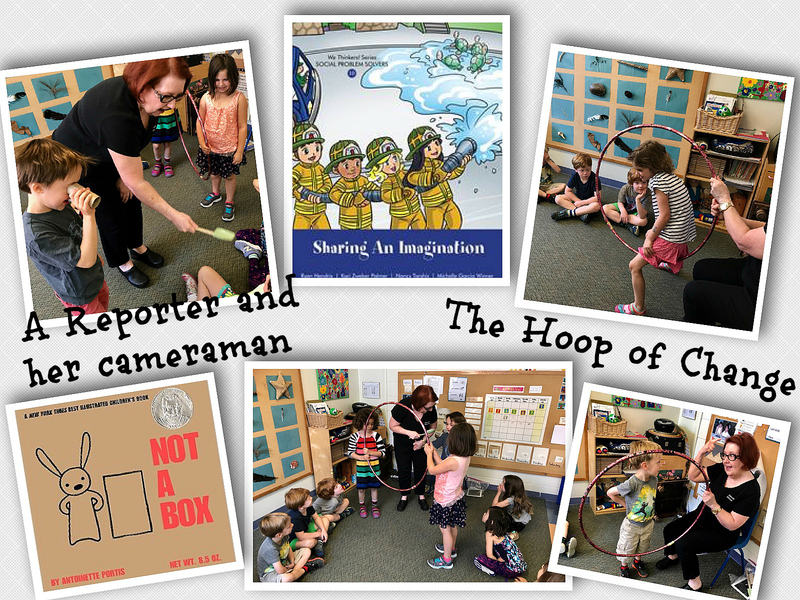 Francis and I stepped through The Hoop of Change and pretended to be a reporter and her cameraman. We pretended that the spatula was a microphone and the cardboard tube was a video camera as we interviewed the children and asked about their spring break adventures. Others stepped through The Hoop of Change and pretended to be cheetahs, lions and tigers hunting on the savanna. Once they stepped back through The Hoop, they were children again! Often, children with social learning challenges have difficulty joining and staying involved in this type of play and conversation. Some children find it difficult to imagine someone else’s experience or point of view if it’s not their own. Shared imagination helps us to imagine what characters are thinking and what might be their intentions; it is at the heart of reading comprehension, narrative language, and written expression. Working through We Thinkers! Series Vol. 2 Social Problem Solvers Curriculum (http://socialthinking.com) has been a blast for all of us! Not a Box, by Antoinette Portis, is a beloved book with this group; it inspires conversation about sharing an imagination.